Aristotle was one of the greatest ancient Greek philosophers and writers, rivaled only by Plato. Aristotle surveyed the entire scope of human knowledge as it was known in his day and his theories continue to influence Western and Muslim thought today. For Aristotle, logic meant: Articulate the conditions, then ascertain the cause. He was the first philosopher to create a systematic process of logical deduction, which proposed that two valid propositions give rise to a third, equally valid, proposition. Because the scope of his explorations were so broad, he was able to formulate general philosophy. The underlying base of this philosophy was that human goodness is the active exercise of rational facilities. Born in Stageira, he is sometimes referred to as the Stagirite. He was the son of Phaescidice, the court physician to the king of Macedonia; however, both his parents died when he was just a child. Following their deaths, he was sent to study at the Athenian Academy of Plato in 367 B.C. Aristotle remained at the Academy as a student and then a teacher for twenty years, leaving only after Plato's death. He was invited to join Hermias, king of Atarneus in Mysia and married his niece, Phythias, who was the adopted daughter of the king. Together, Aristotle and his wife had a daughter, also named Phythias. Aristotle established academies in Assus and Mytilene. For three years, he tutored Alexander the Great, beginning when the child was thirteen years old. At the age of 50, Aristotle opened the Lyceum, a school in Athens which instituted research in all areas of human endeavor. Most of Aristotle's work remains in the seminar notes he prepared for hundreds of class lectures. The notes were edited by the last head of the Lyceum, Andronicus of Rhodes, about three hundred years after Aristotle's death. Soon after his return to Athens, Aristotle's wife died. 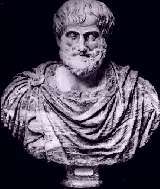 Aristotle then had a relationship with Herplylis, with whom he had a son named Nicomachus. When the death of Alexander the Great was followed by a wave of anti-Macedonian sentiment in 323 B.C., Aristotle left the city for Chalcis where he died. Aristotle's primary contributions were to biology and history in which fields he taught hundreds of lectures. His unusual habit of walking with his pupils under a covered court, or peripatos, while teaching inspired others to refer to the school as the Peripatetic school. There was a rediscovery of the works of Aristotle in the sixteenth century Italian Renaissance, and in France a century later. He was an important influence on writers during this period, and subsequently on the thinking and writing of John Dryden and Samuel Johnson to name a few.